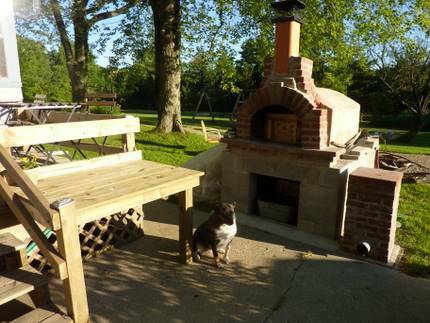 I love bread, so in the fall of 2009 and spring of 2010 we built an outdoor masonry oven right outside our back door. You can call it a pizza oven, a wood-fired oven, or whatever you like; like the term “greenhouse” it’s a squishy term, this oven. Personally, I call mine Loven. The concept behind it is very simple. It is based on retained heat within a large thermal mass. I based my oven on an Alan Scott design; this book was very helpful with all the background information I needed to build it. 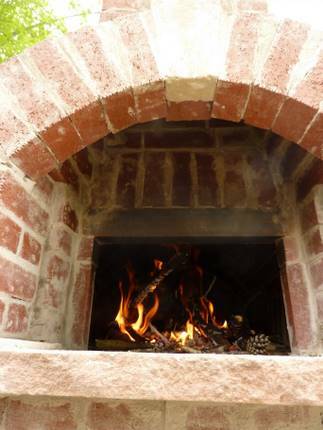 Within the oven itself, it has a firebrick floor and solid brick walls and ceiling (barrel vault in shape). The body of the oven is sitting atop six inches of concrete (two pours, one bottom 2″ pour of insulated concrete, the second 4″ of regular concrete. The outside is capped with 2-1/2″ concrete, 2-3″ of perlite insulation, and the whole thing is topped by a fire blanket. It is housed within a metal stud “house” with cement board sheathing (which holds the perlite in) and Hardiboard (cement board) siding, and a metal roof. Firing the oven is a bit of work, but we do have a nearly endless supply of wood to burn out here. We use it weekly, summer and winter. First, we fill the entire oven body with scrap wood (3″ or less in diameter) and brush. The smaller the wood, the hotter the fire: our object is not to have a yule log in there sputtering away for hours; instead, it’s a game of let’s see how little time it takes to make it get really hot. Once the wood burns down to coals (usually about three to four hours), we scrape out the ashes and glowing coals then clean out the oven with a dampened rag mop. We then close the oven door to let it equalize for about another hour. By this time, it is between 400-500 degrees F and is ready for bread. The oven fits about 17 loaf pans. It takes barely a half hour to cook all that bread. And no, the loaves do not taste like woodsmoke. It’s not just for bread, though. It’s an oven, and so you can cook anything in one that you’d cook in a conventional oven. For pizza, we don’t bother scraping/mopping. We simply push the coals back and cook them in there, two at a time, right on the ashy oven floor; it takes about 3 minutes (!) to do it; we turn them around so they cook evenly. It’s fun, but you have to have all your stuff ready to go! After the pizzas we can proceed to cleaning out the oven and doing bread, or doing whatever else I would like to roast: chicken does nicely on a cast-iron skillet in a hot oven; potatoes, casseroles, souffles, etc. ; whatever suits your fancy. Frankly I have not done cookies in it, but I have made pita in skillets with the fire still going, and I have caramelized and roasted all manner of garden veg this same way. What is fun is that the oven holds its heat over a long time. Stuff that needs the heat goes first but stews and pots of beans or pans of winter squash or the endless tomatoes that I can all spend time in the cooling oven. Overnight, I often let a pan of yogurt cook down into a spread: it caramelizes quite nicely. Candied nuts do too, as does garlic or onions or shallots. In the morning it’s still hot (150-250 degrees), which really amazes me. I have only been using it since April of 2010 so I’m quite sure I have barely tapped its potential. Here is a link to all the posts I have done on Loven and outdoor kitchen.